Have you ever wondered what it looks like to have a small business in a developing nation? 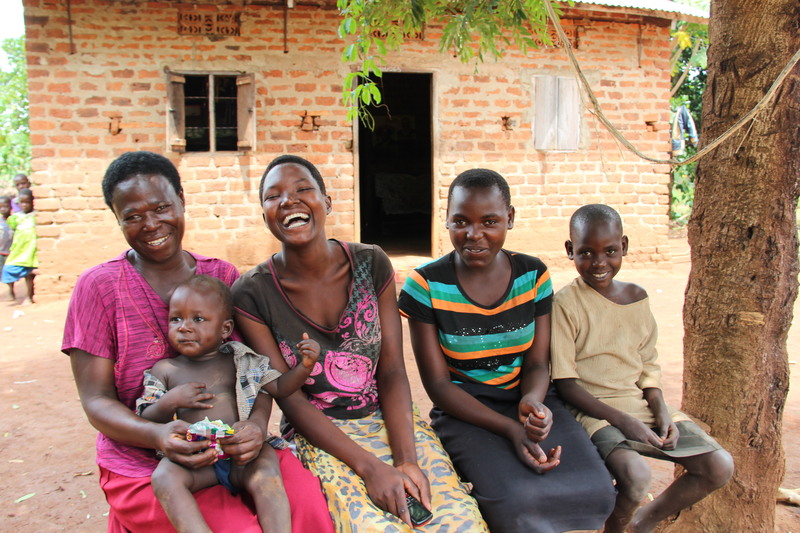 Please allow me to introduce you to Becka Babwairani, a 45 year old mother of 5 girls in Uganda. Her husband left her 3 years ago because she was unable to produce a boy for him. Left to her own devices to support a growing and needy family, she worked as a digger on a nearby farm. After attending BeadforLife’s Street Business School training in Bulogo with the Bulogo Women’s Group, Becka learned she had the potential to be one savvy entrepreneur! Pictured above with her sweet snacking bananas, eggs from chickens she rears, as well as cooking oil she sells for as little as a tablespoons at a time (100-200 UGS about .05$). 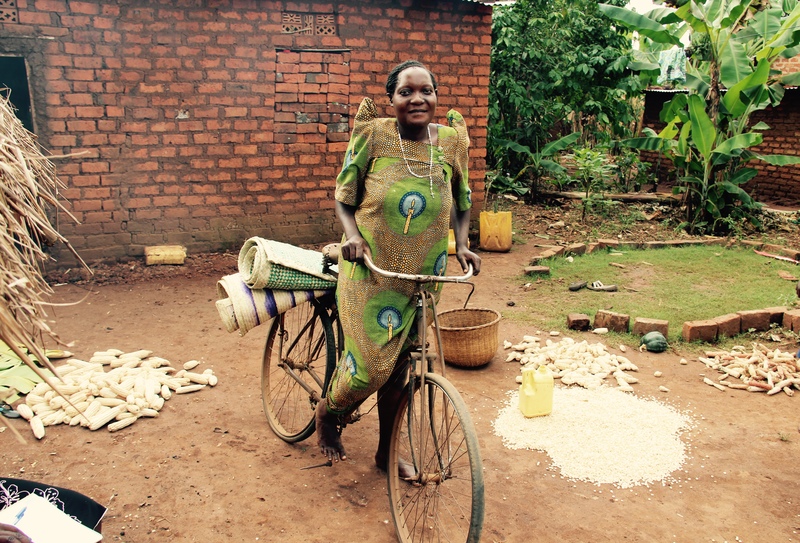 Becka started her business selling cooking oil, a Ugandan staple, bit by bit. Gradually, she reinvested profits to grow and expand her businesses that also include a small retail shop in the front room of her home, where she sells g-nuts (local nut similar to a peanut, used to make a delicious sauce poured over cooked beans) biscuits, laundry soap, sugar, and other small commodities. While we were talking, a young boy stopped to buy some bananas and she instructed one of her beautiful daughters to “be sure to put that money in the banana business compartment”. Becka keeps track of her businesses separately, a result of the bookkeeping training session. She understands the fundamental business principles of ROI, and is now empowered to monitor the individual successes of her small businesses. Seated on a simple hand hewn wooden bench with 3 of her girls, Left to right: Lovinsa 18, Sylvia 15, Gloria 7, and her grandson Jeffrey on her lap, she shared with us ripple effect her training is having on her community, in particular her faith community. According to Becka, she has started a “hunger” for education and business training in her church community, and feels fortunate to be a testimony of change and access to training and opportunity. It didn’t stop there, Becka later on shared in her story that her goal is to move to the larger town of Nmendwa in order to further expand her businesses. As the leader in her home, and a leader in her church, Becka seeks to provide the best for her families, modeling a hard work ethic for her 4 girls whom she hopes to keep in school and continue to provide for their school fees- a right reserved for those with income capacity. I am drawing near the end of Maya Angelou’s autobiography, “I Know Why the Caged Bird Sings“, and have been contemplating the power of education. Through her incredibly descriptive account of her life’s hardships, I have been afforded a glimpse into the history of racial discrimination, been exposed to a wealth of rich vocabulary, and have pondered the transformational impacts of educating women. Each causing me to reflect, research, and mull them over in my relentlessly analytical mind. Maya, like Becka, displayed a level of determination in life that is driven from within, from a place of deep-rooted injustices caused to her, and makes the choice to overcome. Never underestimate your own or another’s potential. 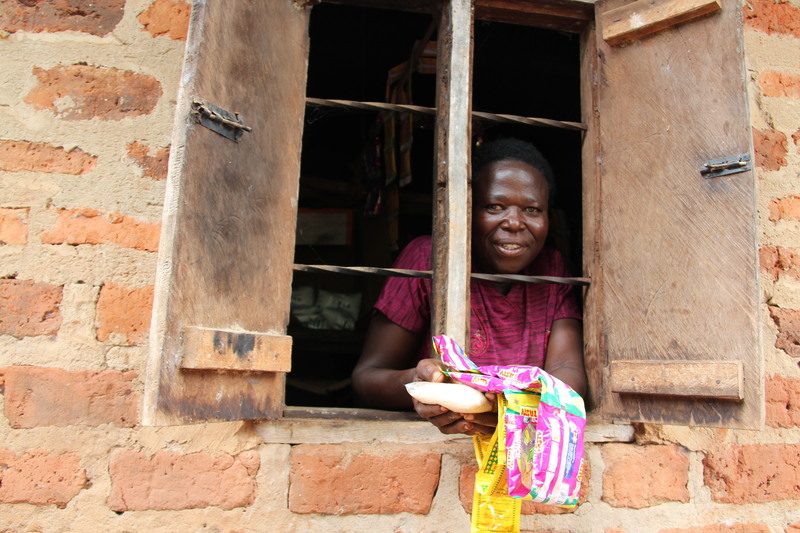 For more information on how you can help deliver the promise of opportunity to a woman living in extreme poverty in Uganda, please click the link below! Tomorrow the “Ignite One Million” campaign will go public! Riding into to town to do business. It was our 3rd home visit in Bulogo of the day… the afternoon ripe with the sound of the African sun warming the fields as we pulled up to see Annet outside of her home working with banana leaves while her daughter was under the umbrella- like shade of a banana tree putting the finishing touches on the most beautiful hand woven palm branch mat. Freshly picked maize cobs adorned Annet’s front yard- some full of plump butter yellow kernels for roasting, and others stripped of the kernels which lay in a giant pile to the side waiting for the sun to dry them inside and out before being pummeled into flour for market. Annet is 32 years young, with 4 children ages 16, 14, 10, and 8. Three are girls, and one boy. I was struck by the beautiful chartreuse and yellow patterned dress she was wearing, especially the small candle with a flame inside one of the inner circles- the flame glowing and burning bright, like her future thanks to the Street Business School courses she has completed under the protective mango tree in town. A plastic rosary adorned Annet’s strong neck like a halo of spiritual encouragement. We squatted on a small ledge outside of her thatched roof kitchen and exchanged probing questions with heartfelt, quiet-voiced replies. The sort of answers given by someone wholeheartedly believing- and wanting- the listening audience to be larger than the sole interviewer. 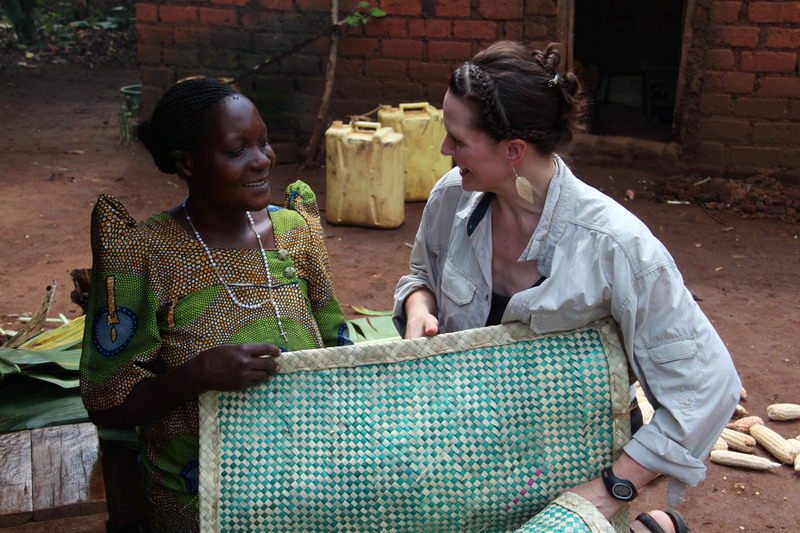 Annet, I learned, began her first business with 5,000 Ugandan Schillings. – about 1.50$. She purchased supplies to weave 3 traditional style mats, which she ended up selling and reinvesting the profits to launch her second business of selling plastic shoes. Who doesn’t need plastic shoes? Smart business investment. She told us that after her business training, she decided to rear goats in the village in order to save up the first 5,000UGS to launch her mat- making business. Taking one week to weave a mat from start to finish, we were so impressed with her ability to take things one step at a time, and develop her skills one day at time– knowing she would increase her speed and design diversity as time came to pass. Have you reached the point in life where you are done “making a point” and would like to “make a difference” ? “I was feeling a bit lazy, and weak… but now, I am out of my comfort zone, ” shares Annet when I asked her to share how BeadforLife’s training has helped her in life. The comfort zone. Safe place to be, but spiritually impoverished. If we rest in the places that are only familiar to us, how will we ever grow? How will we give ourselves an opportunity to evolve and carry out a purpose bigger than ourselves? I purchased Annet’s green and white checked palm branch mat at the end of our interview, appreciating her hard work and the beauty of the time and dedication represented by each folded branch. This palm branch mat is like an organic tapestry, telling the story of her former life being folded over, and made bright and new. I am so excited to have this piece of art to share with others and remind me continually to challenge my personal comfort zone. For it is in these times of discomfort that our wings are stretched allowing us to fly a bit higher, soar a bit further, and rise a bit taller. thanking Annet for allowing me to purchase this beautiful mat. to be encouraged musically, please listen to these soul-lifting lyrics of Start A Fire! I just LOVE LOVE LOVE this song!!!! It starts with each one of us! Mutungo women in SBS 12 team up in preparation for group presentations. I have always loved the number 3. As a professional in the fine jewelry industry, symbolism is everything. Deeper meaning to be found with every number, every color, and each and every aspect of an object- tangible or intangible. As I reflect back on my insightful first two days in the village of Mutungo with BeadforLife’s 12th Street Business School cohort, I am amazed at the fundamental principles and the manner in which they are taught to women at the base of the economic pyramid. Women whose daily earnings average between $.60- $1.25 a day before the 6 month entrepreneurial training sessions. As I sat at the side of the make-shift classroom of over 75 women , I observed so many things that grabbed my attention- causing me to pause, and take a mental snapshot in my mind. Things like the number of children, some showing signs of Kwashiokor- a common type of protein deficiency seen in children living in third world countries- sitting on their mother’s lap quietly while she focuses on absorbing the life-lifting content from Rachel, Clare, and Joanita- the dedicated, hardworking, and compassionate trainers of the Street Business School program. I noticed that this mobile classroom was in effect a local village church, which seemed the most appropriate setting for the trainings which began with some combination of a dance circle followed by the most lovely group song of praise, which I have listened to over and over on a recorded video since experiencing the joy in the room that day. The spirit just filled the air after the women thanked God for the day, and for the blessings He has bestowed on each and every one of them. I could just feel the shift in the air, a peace swirling around with the heavenliest of scents. The first session I attended focused on the concept of finding capital and starting small. For homework the previous session, the women were asked to bring in an item they could use for capital to launch their small business. This was like a show and tell of sorts, and really changed my perspective on what it takes to get a small business off the ground. As the women were being encouraged to think of themselves as the fundamental capital generator- not the capital itself, I thought about the challenge this poses to women who are so desperately lacking in self- confidence- a result of living in extreme poverty and the interwoven web of difficulty this encompasses for their entire lives. Imagine asking a middle aged woman with no more than a primary school education, with 3-6 children in tow to believe that she is the most important factor in starting her own business and changing her life forever. She, not the money, will be the starting point. Her idea, her belief in her business and belief in herself. This was incredibly awe-inspiring to witness this level of teaching, engagement, and the level of belief BeadforLife has in the implementation of it’s proven, tailored entrepreneurial training model. Thanks to my kind-hearted and lovable Luganda translator and BeadforLife colleague, Coach Clare, I quickly copied into one of my spiral bound notebooks the powerful message given by Coach Rachel to the group. “I want you to be different, to start a change in your family today. You are not poor. Your head is poor. Unless you understand that capital is you, you will not succeed!” Coach Rachel stands about an inch over five feet tall, petite as can be, beautiful braids in her hair with fuchsia colored tips dressed in an ankle length skirt and cardigan set carefully chosen that morning to present her best self in the most professional light to the group. Her strength maintaining the attention of such a robust congregation is a fine example of the phrase, ” where there’s a will, there’s a way.” The fortitude in her voice, compassion in her heart, and life-force in her aura captured my heart, compelling me to share it with you all. These three coaches working together as a team to improve the lives of women who would otherwise be written off will forever stay with me, and it is truly an honor to share with you how dedicated they truly are, not to mention the stamina they possess to go into the field and repeat this work day in and day out. It is not easy. My hat goes off to each and every field-worker in the world. Having walked a few weeks in their shoes, they are now my unsung heroes. Adapted from the proven 18 month “Beads to Business” model which focuses on income generating opportunities through the creation of and sale of recycled paper beaded jewelry sold in international markets, the Street Business School was born. The school has 3 core components- taken from the Beads to Business program- including a rigorous selection process, tailored business content adapted for small-scale start ups in developing nations, and a focus on relationship building and mentoring. The beauty of the Street Business School model is it’s scalability. It is not dependent on outside markets for growth, and allows for an increased enrollment of women at a lower cost per participant. These two holistic programs envision the poorest of women empowered and enabled to start sustainable business ventures rooted in the local economy. I appreciated each aspect for different reasons, but something about the mentoring stood out to me. There is a beautiful, mutual respect between trainers and participants in the Street Business Program as is evidenced by the use of the appellation “coach”. Each woman believing she has something valuable to learn from the other. What a lovely sign of respect, and shared humanity. I found myself humbled- as I , too, was learning about business training. It felt like I was a participant in the class, not an observer. I was a participant. To end the 3 hour session, a previous Street Business School graduate with thriving businesses shares her story in front of the group- reinforcing the efficacy of the teaching, as well as creating buy-in by current enrollees. I listened as Hadijah Kirombe stood up in front of the class and gave a detailed account how she was able to lift herself from poverty as a direct result of the trainings she received- offered at no charge by BeadforLife. Hadijah shared how her life had been transformed. She began by selling off 30,000 UGS worth of unused, discarded items she had been holding on to, and invested that money into materials allowing her to weave beautiful Nubian style mats. Moving from door to door and within various markets, a skill referred to as ” kutembeya”, Hadijah began to have a steady stream of income. She stressed, ” as a single mother, I didn’t undermine any job. Each time the trainers spoke to me they spoke to my heart, to me directly… as if I needed to hear it in order to change.” Addija continued to impress upon the class with her detailed explanations of exactly how she managed to turn the tides of poverty away from her. 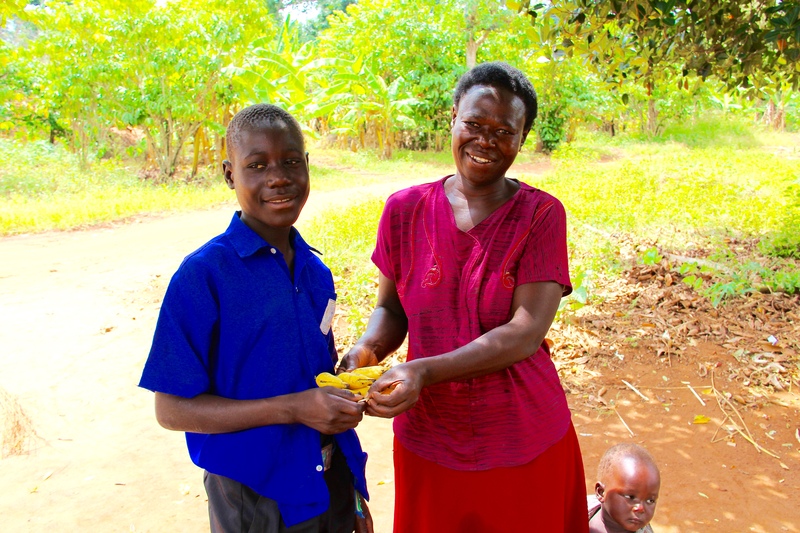 She now sells mushrooms, makes her own briquettes, weaves intricate “katinge” mats, and has taught her children to knit- so they can help create products for her to sell which will in turn be used to fund their school fees! Addija then shared how she travels to local prisons and purchases hand made bags made by the incarcerated women, and resells them along with her other wares. How impressive to see her willingness to give back after all she has been through. May you be inspired by Hadija, the coaches, and yourself to begin a venture you never dreamed possible. Remember: Start Small. Start with you. We pulled up the long rural driveway with Julius, our driver, coach Ritah- one of the compassionate and dedicated street business school trainers in Bulogo, and my BeadforLife colleague- coach Phoebe- to our final on-site business visit for the day in Bulogo village, about 45 minutes drive north of Kamuli town. What a wonderful surprise to end the long day of field interviews! Monica Mwesigwa was seated on a small wooden bench outside of her free standing outdoor brick kitchen with a thatched roof, rolling out carefully prepared and mixed dough for her newly launched and thriving small business selling banana pancakes. These are not the traditional pancakes to which we are accustomed, light and fluffy golden colored cakes topped with melted butter and dripping with maple syrup, but rather a dense sort of croquette– a mixture of locally sourced and hand processed cassava flour, smashed bananas and a pinch of baking soda. Rolled out and cut into small circles with her multi purpose plastic cup and empty recycled glass bottle, she handed them to her daughter – 1 of 6 children ranging in age from 17 to 1 and 1/2 yrs- who was tending the indoor charcoal fire over which rest a pot of boiling hot oil to deep fry these sweet little snacks! As we talked with Monica, age 33, we could just sense her incredible entrepreneurial spirit! Waves of smoke escaped from the small outdoor kitchen, encircling our senses as we snapped photographs and filmed quick feature videos, highlighting her amazing success! Monica enrolled in November 2014 with the first class of Bulogo Women’s Group, consisting of 20 members. Bulogo Women’s Group is one of the first partner organizations to replicate the business training curriculum and mentoring developed and introduced by BeadforLife’s Street Business School program- currently under expansion with the goal of providing entrepreneurial training for 1 million women living in extreme poverty worldwide. By December, only a couple short weeks after her first few business building training sessions, Monica had already launched her pancake selling business! She sold 1 chicken at the rate of 11,000 UGS (approx $3.25) to obtain the capital she needed to get her small business off the ground. Monica shared with us that she used to eat chicken she raised until she learned in one of the trainings she had the choice and opportunity to sell one instead- giving her financial means to save and invest for a business. Sparked by these fundamental business lessons, one of which encourages women to “start small” and understand the temporary nature of their present difficulties, Monica applied herself in earnest. This takes wholehearted belief and trust, and Monica decided to embrace change and take that risk. 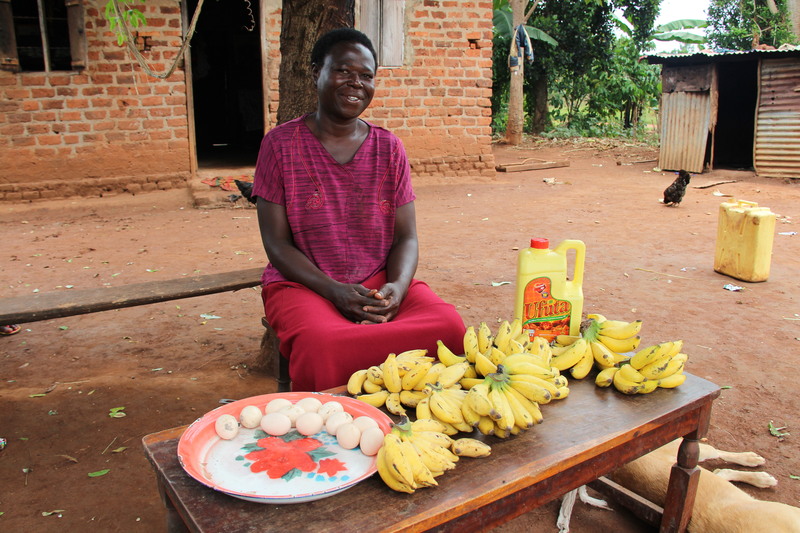 Investing the profits from her pancake business, Monica launched her second business – selling a homemade secret recipe banana juice. She sells these by the 400 or 500 ml cup in town. She shared with us that she earns about 2,500-3,000 UGS profit daily from her juice (approx .75-.80) as well as a profit of 3,000 UGS from her pancake business daily. She is now earning close to $2 a day and is continuing to expand. She has more than doubled her income and her graduation date is set for next month in Bulogo village! Like all entrepreneurs, Monica faces challenges. Currently, she told us she is challenged by lack of access to the specific variety of ripe bananas to meet her growing demand for the juice. Tending to her 6 children in addition to running her businesses proves challenging, but Monica is so passionate and driven we are unequivocally convinced she will have continued success! As we left her bustling home workshop, we thanked her profusely for her time, as well as her earnest efforts in English to help us film a short video of her tremendous accomplishments. What a courageous and brave woman- so incredibly wise for her young 33 years. I left home early July with a particular definition and understanding of the words “courage” and “bravery”, and enjoy experiencing the evolution of this definition with each passing day shared with some of the most enterprising, and tenacious women I will have ever met in my life. I am truly blessed for these encounters and for the lessons they have continued to teach me along this unimaginably profound journey. 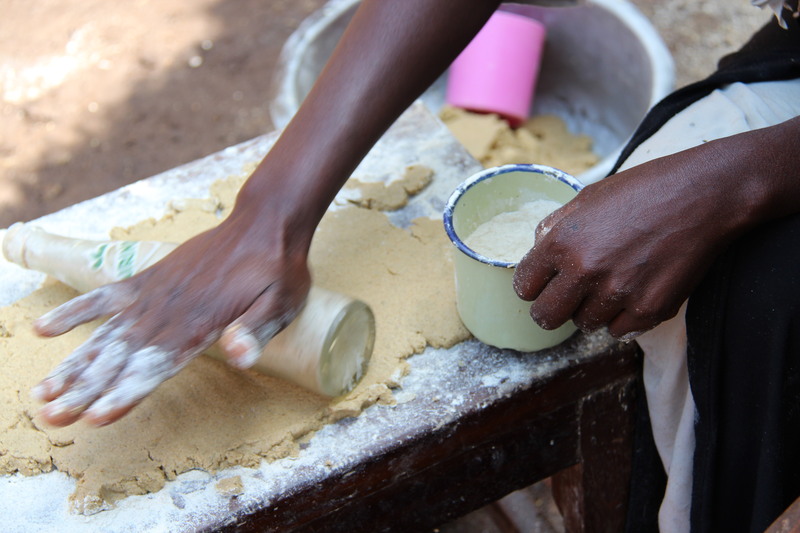 rolling out Cassava flour, bananas, and baking soda to prepare her pancakes for sale. Harsh Realities of Life in the Developing World. Greetings from plot 96 on Bunyoni Rd, Kataza district Kampala, Uganda! Finished up a load of hand washing as the morning rain finally ceased and the sun will shine for exactly 4 and a half more hours- just long enough to take the heavy dampness off my two boldly printed, safety pinned waistband maxi skirts and pair of light weight cotton pajamas drying on the rusted metal clothes line we share with the neighboring apartment housing two brilliant young sisters- both university graduates still seeking employment opportunities after two years. Seems the complexities of my first three weeks in Uganda- and first time in sub Saharan Africa have finally brought me to a moment of deep contemplation, even fearful realizations I had to address. I am writing from the comfort of my humble abode today, recognizing the need to hit the “pause and process” button on my African adventure transistor radio. Monday’s completed field visit to Bulogo women’s group was the pinnacle of this “Awakening” – an expression I borrow from shame researcher and author, Brenee Brown. I returned late that evening after a difficult return trip stuck in hours of typical rush hour “jams” as they are called here. The nights can grow so dim, literally no street lights, only the burning flames of small kerosene lamps aglow lighting small tables of smoked fish, unrefrigerated meats, fruit and vegetable stands, and the scent of burning piles of rubbish in the air thick and heavy with the darkness of night. The traffic in Kampala hits a head in the am for three hours and at night for at least 3 hours. The city streets are literally gridlocked- with cars, matatus, bodas, cyclists, and people scrambling for a place to inch forward. I liken crossing one of these streets to a human game of “Frogger” – without the slightest bit of exaggeration in the analogy. It was bound to hit me- the wall. And so yesterday morning brought me to a halt. I landed in Uganda and have remained a human funnel – wide at the top desiring to take in as many fluid experiences as I possibly could these first 3 weeks that I was like a cheerfully colored latex birthday party balloon gorging down air filling to the widest stretches of itself before bursting in excess – in my case – emotional overload. I sat paralyzed at my desk in the inventory room shared by a young American named Steve, and began to think I may not be able to handle any more. My arms and neck stayed stiff like boards, hands felt like jittery fingers in the middle of a cold winter’s day. The “clip clip clip ” of the gardener’s shears on the bushes outside my office were literally fraying my nerves. I grabbed my phone, plugged in the little white earbuds and attempted to drown out the surfacing feelings with some orchestral Italian harp music I downloaded in the early hours the morning of my departure from home- unable to sleep. Recognizing the signs of anxiety- I reached for two things- my phone and two calming homeopathic sleep tablets called Calms Forte. Unsuccessfully skyping my husband and parents with whom I had not communicated in two days – for lack of wifi access- I had to follow the normal self- soothing protocol and realize this time was bound to come and was totally normal. Today’s working from “home” has allowed me to experience tremendous insight into my work here, as well as space to process the varied experiences so far. I think I arrived in Uganda with my ” wow this is all novel! ” lenses, then transitioned to ” hmmm, that’s odd but I understand its part of life here”, to ” oh my word, life is just so difficult here, and I am totally overwhelmed by the daily realities for so many Ugandans” lenses. Humans don’t share much in common with these transition lenses outside of the different cast of light they let in your frame of view. I am learning and experiencing the time- consuming tasks of hand washing, line drying, and ironing every piece to be sure to singe any trace of mango fly eggs that were hatched on your damp clothing – lest you forget and it buries itself and hatches underneath your skin like it did to our neighbor Lee the week we arrived- requiring a small incision to be made to remove the worm under her skin that had grown. I am learning to allow myself to feel the raw feelings of fear – as they relate to embracing change and accepting discomfort. Living with roaches, armies of ants, geckos on the walls, mosquitoes everywhere, all while viewing the injustices all around of people living in abject poverty will take it’s toll. Each day for the past 3 weeks as I leave the iron gate of my compound in Kataza and walk down Bunyoni road to begin my Teva- sandaled trek to work, I am confronted with the horrible realities of life in the developing world. I have lived and worked abroad in Israel, and various places in Europe for extended periods of time, but none of those trips would be able to properly prepare me for the sights I would witness in sub-Saharan Africa. I’d love to be able to insert more specific and startling statistics on things like the lack of indoor plumbing and running water data,or the rates of incidence of untreated bronchial infections in women and children due to daily cooking over and inhaling charcoal fumes, in the country- which I know would be astounding, however I very quickly became used to the fact that I do not have instant access to wifi when and wherever I want. Today’s quiet day allowed me to reflect and write stories on the members of Bulogo Womens group. Space to process. Space to pause and to revisit my commitment of coming here in the first place. Humanity is a shared experience- this is proven to me over and over again as I make it through another day on the ground. I love the write up by Tara Sophia Mohr called, “10 Rules for Brilliant Women”. Rule #1: Make a pact. This piece of advice aligns with the core messaging of the Street Business School training I attended in Mutungo last week with the 12th enrolled class of over 75 women and some of their children. YOU are the business. YOU are the capital. YOU must believe in the power YOU have in YOU and make a commitment, a pact, with yourself and trust in it’s potential. I challenge you to think about a pact you would like to make with yourself. What would it look like? What would it say? What would be the impact of this self commitment? Know it may be scary along the way, but in retrospect, an adventure worth the risk it took to get there! Thanks for allowing me the opportunity to be transparent and real with my thoughts- we don’t help anyone by acting like we have it all together all of the time- vulnerability and truth lead to connectivity! Make a pact to implement a small change and share with someone you love! On the road again Monday morning by 7:30 am heading towards Kamuli, Uganda in the east. About 45 miles north of the town of Jinja- the source of the Nile River! I’ve come to anticipate an adventure each time I embark on field work. Travel, traffic, and the sights on the ground mix around me like an unfamiliar collection of spices from a foreign land. Traveling east on Jinja road, we passed through a bustling meat market town called Najjembe, where hoards of workers dressed in blue uniforms wave sticks of street meat – mostly chicken- trying to get your attention! As you slow down to pass through this food refill town, your vehicle is essentially overtaken with people pressed against all 4 windows trying to sell you sticks of meat, bags of bananas- over 5 varieties- avocados, tomatoes, as well as cold bottled beverages like water or orange soda pop! Our driver picked up a bag of sweet bananas, and my colleague selected a sack of roasted plantains to be enjoyed on the ride to our destination. Shortly after that smoke filled meat rest stop, we passed through the lush valley of the Mabire Forest. 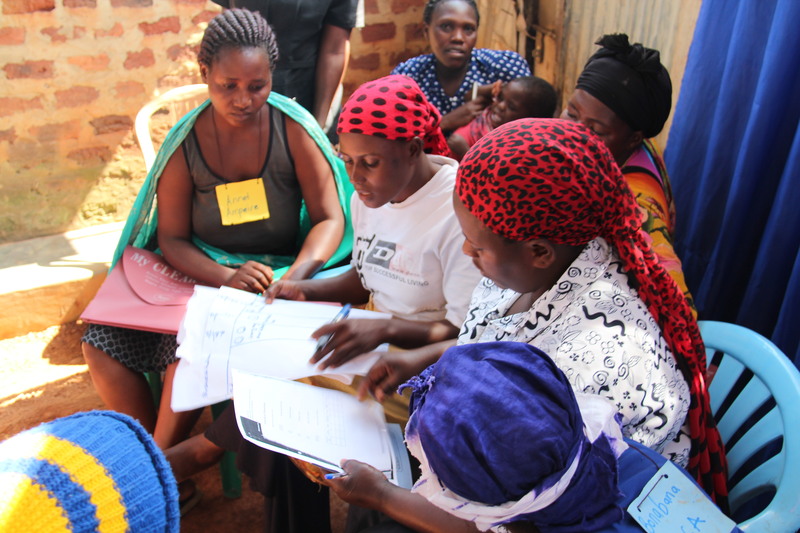 Our work today centered on field interviews with current members of the Bulogo Women’s group- the first partner organization here in Uganda to replicate and test the Street Business School 6 month entrepreneurial training methodology for the poorest women in the rural village of Bulogo. Led by the warm and nurturing mama Esther and coach Ritah, we were introduced to a quarter of the group due to graduate next month! Each and every visit to the women’s homes and places of business was exhilarating and encouraging! We were seeing first hand the impact that BeadforLife’s Street Business School expansion project was having in rural villages in Uganda! Our first encounter was with the loveliest woman named Regina Nakalanzi. Regina is 49 years old, married, and has four children. Inspired by the content of her very first training session at the street business school (held under a large mango tree with the trunk of the tree posing as an easel for white paper held up by two members), she managed to string a couple of independent thoughts together and sold a small basket woven of palm branches for a mere 15,000 UGS- a bit less than $5USD. After the sale of a second basket, she invested the proceeds in order to buy a piglet! Embracing the notion of “starting small” with her business, she continued to put lessons to practice at home and begin to save and eventually have her own male pig which would help her financially! When she’s not busy running her most profitable business, the piggery, she works as the village hairdresser! An old passion of hers that went by the way side due to life’s daily struggles with farming and subsisting- she decided to rekindle her love with this business as well! Honing her skills, and dedicating more energy than usual on this, she has become one busy beautician- especially in December around the holidays! She weaves baskets on the side, and also grows and sells small harvests of sim-sim- sesame seeds- for additional profits. Regina was raised by her uncle after her father passed away at a young age. She never made it through secondary school, and while she had a later opportunity in life to attend a nursing program, she failed to complete it due to lack of school fees to fund her studies. She found herself in a stagnant place – feeling restless, tired, defeated, an complacent for a number of years. Thanks to BeadforLife’s partnering with Bulogo Women’s group, Regina’s dreams to be independent and successful in life came true! She rose up from her lowest point- having lived in a mud hut with a tin roof when she arrived to Bulogo village and not able to send her children to school. Selling small bags of maize which she harvested by herself, she was able to purchase 7 iron sheets to begin to provide a better shelter for herself. When asked what advice she would give to other women who may be considering joining a business training program, she said ” you must be patient in marriage, and in business. Save, be creative, and always remember to take a portion of your profits and reinvest them to expand you businesses!” Spoken like a true entrepreneur! I was blessed to have the village hairdresser demonstrate her hair braiding talent on my muzungu hair and that was fun for us both! She has never braided a white person’s hair and I have never experienced the fast paced, super tight small rows placed nearly on my scalp! It was great fun and a shared blessing indeed! I was incredibly inspired by her hard work, and enterprising spirit! Thankful for this cool, cloudy Sunday morning for spiritual refilling at Mbuya church. Enjoying the lullaby of a heavy -early morning rainfall, I woke up from a Benadryl’s night rest. Benadryl has been a good friend to me helping reduce the swollen itchy welts all over my legs- which after two weeks in Uganda look like a battlefield of scratches, scabs, and discoloration after many a night of itching, digging, smacking, pinching, fingernail pricking and any other manner of reducing persistent itching, swelling, and irritation. I share this only to show how it pales in comparison to the annoyances and aggravations faced by nearly each and every woman I meet in the programs here at BeadforLife. Suffice it to say that today’s message at church about complaining and provision by God – taken from Exodus 16- and John chapter 6 helped put my wandering thoughts about perceived difficulties back into perspective. I joined fellow BeadforLife staff member and friend, Phoebe, yesterday for a meal at her home in Buziga- a beautiful neighborhood accessed by a series of bumpy, severely pot holed dirt roads. Her home is so lovely and is as open as her Giant heart! Papayas, green beans, avocados, passion fruit, and more grow in her garden outside, while wild turkeys and chickens frequent her front porch! I love cooking- and Phoebe provided the first real opportunity to prepare local Ugandan cuisine together with her in her cozy home with husband Ben, and two children- Tendo almost 4, and Carol-2. Matoke steaming in fresh banana leaves on one burner, rice boiling on another, and gorgeous halved plantains sautéing in golden bubbling hot oil in another saucepan! We were friends cooking together over a hot stove, talking like women do- enjoying the simple gift of each other’s company! What a blessing it was! After sharing a hearty meal, we loaded up Tendo, Carol, and some cousins from down the street and headed to Ggaba village – a small bustling fishing waterfront district on the coast of Lake Victoria. We walked hand in hand through the Saturday markets where one can purchase anything from saucepans, to wooden spoons, to firewood for cooking. Heaping piles of tomatoes and “Irish”- white potatoes- stacked like cairns on a hiker’s trail marking the way! A sensory overload- a feast for the eyes and the nose! After watching birds nosedive in the blue lake searching for food, storks perched on the edge of rickety and sun faded wooden boats, we held hands again and returned back through the bustling marketplace. On our right, outside of a crowded firewood marketplace, I noticed a girl about the age of 10-11 years old sitting on a stool covered in the most horrendous 3rd degree burns imaginable. Her skin was black and pink in areas where regrowth and healing had occurred, and yellowish-green and bubbling puss covering the length of her right arm, right leg and foot, and right side of her face. Unable to continue to just walk on, I asked Phoebe- and she suggested we approach and offer to assist if we could. Turns out, the young girl- named Susan- was the victim of a severe petrol fire. The co-wife of her father set fire to her home in a rage of jealousy. In an attempt to kill Susan’s mother, believed to be inside, the deranged woman killed Susan’s younger sister and severely burned Susan by pouring petrol on the house and lighting it on fire. Susan’s mother ran inside and was able to to rescue Susan, severely burned. Unable to seek treatment in their local area of Masaka- they were referred to treatment in Kampala- over 4 hours away by an overcrowded taxi making frequent stops. Susan’s mother sells firewood collected to help get money for her daughter’s treatment in the local hospital. All I kept thinking was that if this was at home, this young girl would be hospitalized and her open bubbling 3rd degree wounds wrapped with care in gauze by a nurse in a clean facility with antibiotics given to prevent infections- not to mention some type of generalized pain relief. Yet there Susan sat, people staring at her in dismay and with despair- wondering what her story was. We gave to help her mom what we had available in our hands at that time. Stella grabbed my right hand, and Sylvia my left hand. I think even these two young girls were frightened by what they saw. When our fun day together was over, I gave the girls big hugs and took photos with Phoebe’s energetic son Tendo and contemplative little girl Carol. After rounding the corner of her foster home, Stella peered back, and ran to me again for another big big hug! I held her sweet little head against my belly , hand on her head as she snuggled in for more affection. What a precious little girl- hungry for love. What are you hungry for in life? Do you crave the material things the world tempts us with? Those things designed to help us forget momentarily our appetites for something deeper, more fulfilling? How do you get your spiritual filling and are you even aware that you crave nourishment of another kind? I will be reminded of the Stellas of the world, the Agnes’ of the world, and share the light I have in me given so generously by the grace of God our Heavenly Father from above. Photo: left- Stella(red and white dress) Jen, Sylvia, Joseph, front: Tendo and his baby sister, Carol.